Needless to say, my assault up Angliru was akin to George Clooney trying to get over that mountain of a wave in The Perfect Storm, Wolfgang Petersen’s dramatic film about a swordfishing boat that becomes entrapped by a freakish tempest in the North Atlantic. Try as he might, he just couldn’t see the top. And in a sea of mist, followed by drizzle, followed by heavy rain, neither could I……June 2009. My second foray up Angliru was just an unpleasant reminder of Harry Callaghan’s often quoted line ‘A man’s got to know his limitations’. By the time I reached the steepest section of the climb, 23.6%, yet only 2 kilometres from the summit, my bike was spent and so was I…...June 2012. Rising from a precipitous valley in the Cantabrian Mountains, the Alto de l’ Angliru’s 12.2 kilometre road is little more than a meandering cattle route, recently covered in bitumen. 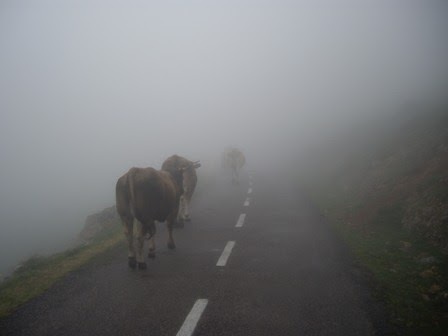 Locally known as La Gamonal, its’ summit is often shrouded in mist and with little to greet you save for the odd cow, looking vaguely uncertain with its surroundings. Having visited it on four occasions, I often wonder why. Addicted to mountain climbs, I guess the first time was out of curiosity and the challenge it brought. The second, and third, were simply out of stubbornness for having ‘failed’ my previous attempts; or perhaps more pertinently, an incurable case of compulsive obsessive disorder. As for the fourth, there was no pressure whatsoever; I just wanted to savour it, most likely for just one last climb. No sooner were we home I couldn’t wait to see Lore. As usual he was tinkering in his garage, building yet another bike. “You couldn’t build me a triple”, I jovially inquired. Straight away, knowing exactly what I meant he replied with a grin, “I told you an extra gear or two would come in handy”……July 2012.
it's much steeper than it looks. Tougher than the Tour de France’s Mont Ventoux and Alpe d’Huez and the Italian pair of Monte Zoncolan and Mortirolo, the Alto de l’Angliru climbs over 1,200 metres at an average gradient of 10.13%. While difficult enough in itself, the climb doesn’t really begin to bite until past the half-hidden intersection of its alternative route from Santa Eulalia. It’s just a few hundred metres from here that the gradient catapults to almost 14%, and stays that way, almost all of the way to the top. A relative latecomer to the Tour, the Alto de l’ Angliru didn’t feature in the Vuelta a España until 1999, when Spanish climber José Maria Jiménez became the first rider onto its summit. Following the disqualification of his friend, Marco Pantani, from that year’s Giro d’Italia, he dedicated his stage victory to the disgraced Italian cyclist. While exceptional climbers of their time, both ironically had lost their battles with cocaine addiction within five years. Since 1999, the climb has featured in the Spanish Tour on six occasions, the last being the Stage 20 race of 2013 when French rider Kenny Elissonde reached the summit ahead of the ultimate Vuelta winner Chris Horner. Other winners include Italian Gilberto Simoni (2000), followed by a trio of Spanish riders, Roberto Heras (2002), Alberto Contador (2008) and Juan José Cobo (2011). "Climbing the Angliru would have been impossible 20 years ago simply because the gears we used were too high. It's only advances in equipment that enable races to be taken up climbs like that now"…… former British cyclist Graham Jones. Just a typical day in the Asturias. Cycling experts generally agree that the right gear ratio (34x32) used by Juan José Cobo in 2011, proved decisive in his Stage 15 victory up Angliru. Maintaining a high cadence, he was able to gradually draw away from his opposition on the climb’s long steep section towards the summit. Leaving the rest of the field in tatters, he finished 48 seconds ahead of his nearest rivals. Normally content to resort to a gear ratio of 34x29 on all my previous climbs throughout Europe, my two failed attempts up Angliru left me with no alternative than to change my sprocket. Like a football team losing a Grand Final because their list was missing three key players, my rear cassette cried out for three new implants on a somewhat discoloured set of teeth. With the dexterity of a dental surgeon, Lore came up with exactly the right combination I needed; a 34x32, just like Juan José Cobo. While having nothing of the Spanish cyclist’s strength and agility on the pedals, I slowly wound my way up the paved goat track for the third time in five years. A climb of two distinct halves, I could at least for now, allow myself the occasional glimpse of the plunging, green valley below. Via an uncomfortable world of zigzagging hairpins I was soon approaching the Cueña les Cabres, the most dreaded section on the entire climb, with its gradients of almost 24%. Having made every bit of use of the last hairpin for more than 500 metres, I disdainfully peered over my handlebars at the relentlessly long, straight section of road ahead. It was here, not two kilometres from the summit that in years gone by I came to grief. Then, in the midst of a mist as thick as pea soup, I came to a sudden, abrupt stop. My back tyre had run out of traction, and my lungs out of air. All power gone, I felt like one of those solar lanterns that only work when the sun’s out……June 2009. I took some solace in the fact that even the professionals suffer on this section of the climb, as epitomized by David Millar’s dummy spit back in 2002. "We’re not animals and this is inhuman," he allegedly cursed as he deliberately pulled up short of the finish line, in effect disqualifying himself from the race. The approach to the summit. While Juan José Cobo’s gear ratio gave his legs the drive to float like Spanish silk, Lore’s 34x32 allowed me to at least turn the pedals. For perhaps the next 15 to 20 minutes – truth be told, I don’t really know for how long – the road became a seemingly never-ending ladder of pain. Continuously off my seat, except for the widest of arcs around each hairpin bend, my gait was tantamount to climbing stairs. But even stairs end somewhere, so eventually with the discomfort almost forgotten I rounded the final bend onto Angliru’s unremarkable apron. A far cry from many of the less remote summits I’d visited in the past, there was nothing at the end of the road, apart from Roz, who as usual, had walked up the last three kilometres. An isolated resting place, made all the more mystical by its veil of mist, we felt as close to home as in our own backyard. For whatever reason, Angliru was in our psyche and it will forever remain that way. That hairpin photo says it all. Third time lucky is the saying, but I assume that just getting to the summit by car would also be lucky. So bloody steep!! Coming down would've been a great experience as well.